Back-Up Story: "History of the Multiverse - Chapter Eight"
The Trickster and Piper are arrested. Mary Marvel threatens to kill Riddler, then releases him when she finds out he's working with Batman. Holly chats with Harlequin in the embassy. The Monitor borrows the Atom's gear and shrinks to go after Ray Palmer with Donna and Jason. 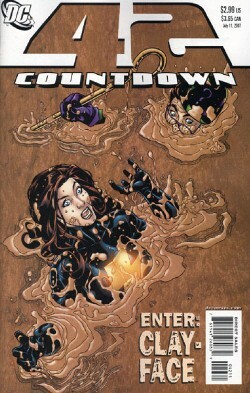 Riddler and Mary Marvel are ambushed by Clayface. Mary kills Clayface by throwing him into space. Karate Kid departs, arguing with Batman. Trickster and Piper escape Deathstroke, cuffed together. Basically, this recounts the Multiverse history portion that includes "Identity Crisis" through "Infinite Crisis." Page 1-4: We establish that Bart is dead, something the entire last issue established. No new information beyond Piper and Trickster being arrested. That's beat one. Page 5-6: The new, EDGIER Mary Marvel threatens to kill Riddler for something it's been readily established for months that he's been doing, working with the cops. Beat two. Page 7-8: Holly and Harlequin indulgently "chat" for two pages. Beat: Somewhat establishment that Harlequin is now "good" and that there are Athenian embassies all over the place, despite the US being at war with the Amazonians. Uh, yeah. Beat three. Page 9, 10, 11: The Monitor, Donna, and Red Hood chat for a while about why they need to find Ray Palmer, then shrink to find him, though I have no idea why the heck the Monitor needs a human with no powers with him, and how the heck shrinking themselves is going to make finding Ray Palmer any easier. Think about it. The smaller you get, the more space there is to search. Dumb@$$. Beat: Monitor and company shrink to go after Ray. Page 12, 13, 14: Riddler and Mary Marvel chat before Clayface ambushes them. Mary KILLS Clayface, and Riddler encourages her to seek a mentor. DC really seems to be embracing heroes who kill with wanton disregard, and seem to allow their heroes to sanction it quite a bit in this series. Beat: Fight with Clayface, the "main piece" of this book. Page 15-16: Batman and Karate Kid chat about the fight that they had before. Karate Kid flies into the sky. Beat: Karate Kid departs. Page 17: Jimmy tries to make his powers resurge, and Lois berates him. Beat: None, really, just Jimmy and Lois talking. Maybe establishing that he can't make his powers occur at will, something already established. Page 18, 19, 20: Trickster and Piper are chatted at by Deathstroke before they blow their way out of a plane while attached at the wrist. Beat: The villains escape. So we have a comic with twenty pages that accomplishes eight beats, three of which are redundant (Karate Kid, Jimmy, and Holly) or irrelevant beyond characterization attempts (which are largely witty banter here, not anything resembling characterization). Of what remains, we have a fight with Clayface vs. a far overpowering foe, Mary Marvel, in a characterization I don't find properly set forth or established, just to show an innocent "girl" character as "bad," which smacks of playing to perverse male instincts. And you all know me here, I'm all about the perverse male instincts. This story, however, leaves a sour taste in my mouth and makes me think, "Man, if that's hot to guys, making an innocent girl turn into a murderer with no regard for safety or what's right, well, sign me off." Trickster and Piper, given that all the endless chatting in previous issues turned me off both the characters and their dilemma, have no real impact for me at all. So they're chained together after being arrested. Who gives a damn, and why should we? What's the investment we're supposed to have with these guys? They just were party to a group that murdered the Flash, and they're supposed to be entertaining? We're supposed to root for them? Huh? Give me a fetus demon over that any day, right guys? Er, wait. Beyond that, who the heck is Ryan Choi, and what's going on with Athenian embassies when the US is fighting the Amazons? Utterly confused, un-entertained, and still glad of my vow not to pay for another of these issues until this starts becoming coherent. Which is hasn't, ten issues in. That's just sad. Main Art - 4: The art is actually pretty strong, content aside. Plenty of detail in the backgrounds, strong action work, and a lot of character in the designs, if not the plot. I also particularly admire the Batman this artist creates, even if the facial expression is a little odd. Good perspective throughout, creative, changing up, if a bit hit and miss in the experimentation. Still, fine work. Back-up Story - 3: Department of redundancy department, given the fact that it's essentially the last three years of stories, but still, for all the redundancy, a good re-telling. I wish it had touched upon what any of this stuff did to continuity, because DiDio certainly hasn't, and I'd like a concensus somewhere between Waid's claims four years ago, Busiek's assertions, which I trust, and the overall universe. Back-up Art - 5: I'm stuck on Jurgens, I really am, and he's making me really dig these historical stories again. I hope someone collects all of these, because they rock with his touch to them. His layouts alone make them incredible. I want him back on Supes, I do. Cover Art - 3: Riddler's off, he's wearing glasses for some reason, and the scene is a bit awkward. Still, the expression on Mary is nice, as is the concept. It's just reminding me of a hard beat I didn't like in the issue, and pushes a bit too hard toward dynamic without being strong in its design as such. But it's not horrible, and the colors are well put together.